This past year, while I’ve been on the same land mass as my family, I’ve had the joy of occasionally travelling up to my brother’s to cook dinner for us all and catch up for the evening. I still feel there’s so much to catch up on…so many days of life and inches of growth that my niece and nephew have experienced while I wasn’t looking, while a sea or two or three and a nation or two or three or ten have separated us. Every few years I’ve parachuted in and seen them that bit older and wiser and chattier and funnier. Yet, I think back to the baby boy I held and spent time with for the first four months of his life before I flew away for the first time. Eighteen years later, he’s taller than me, and he’s still so lovely and he makes my heart swell and hurt with love all at the same time. He’s a butcher in the making just now. He’s always been a sensitive, caring soul in the making. I think back to the little, feisty toddling girl I met for the first time when I traveled back many years ago. She was already a budding actress and a very clever little girl. She could put her mind to anything and do it well. She still can. She loves quiet time. She loves learning. She’s pretty much the same height as me now, and I can’t believe how she’s grown into a young woman already. She knows more about doing her hair and makeup than I do. All while she excels at school. I’m so proud of them both. I love having more time to see them. Though these days I have to take what time they can give me in the midst of their busy, social lives. But I’ll take whatever time and hugs and laughs I can get. I’ll take, and give, as many ‘I love you’ s as we can say. I’ll keep enjoying all the cooking and feeding and sitting and taking around a table as we can manage. Time is short. They are not! They keep growing! #129 Fusilli pasta with ‘Courgette Sauce with Basil and Beaten Egg Yolk’ with brother, nephew and niece at my brother’s table. The inside of an egg holds the promise of the ultimate meringue recipe – half of the insides of four eggs, anyway. This morning I made a batch of meringues for a friend. When I went to bed last night, and as my friends’s birthday came to an end, I fell asleep with the intention to awake the next morning and make those meringues she loves so much. A promised birthday gift, albeit a day late. This morning I woke to an email she’d written last night, after my bedtime, telling us, her friends and family, that her dear brother had died that very day. A day of birth and a day of death. The thing about meringues is that they’re good for both. At least I trust they are. A light crust that holds things together just long enough – until one reaches the soft comfort of the marshmallow-like interior. I hope the meringues are a comfort to this friend as she grieves – with family afar, friends nearby, and alone as she settles into bed to sleep tonight. Line baking tray with baking paper (I use two trays). With electric mixer on medium speed, whip egg whites until they form soft peaks. Turn the mixer to high speed and add the castor sugar a dessert spoon at a time. Beat until the castor sugar is dissolved. Sift in the icing sugar and then fold the mixture with a large metal spoon until it’s combined – don’t overmix. Spoon onto the trays in clumps! I get about 15-16 from this batch – but you could make them bigger or smaller if you prefer. Bake in the oven for an hour – more if they’re not crisp when you touch them. (I swap the trays around on the two shelves in my oven, half-way through the cooking time). When they crusty on the outside, take them out and carefully remove them onto a cooling rack. Serve with a bowl of whipped cream and a bowl of berries. Today, I am to write about the space in which I write. Yet, that very topic brings me face to face with the current crisis that I face. Perhaps ‘crisis’ is a tad dramatic. Yet, as I sit here in this new space, two doors down from my old space, I’m feeling a little anxious. Admittedly a little less anxious than I was a few minutes ago as I tried to approach the new space from a different direction so that the owners of the old space wouldn’t see me. Having memorised my name and coffee order within two visits, I imagined them calling out my name in enthusiastic greeting, only to fade on the last syllable as I slinked past them to the other place. Cafe loyalty or, calling it as it is, disloyalty. I wanted to be loyal. I really did. I’d made headway with remembering the names of the staff and other fellow patrons. I was enjoying the free newspaper and the feeling of belonging. I just wasn’t enjoying the coffee. That’s a problem when you’re sitting in a cafe. It’s not that I’m a coffee snob. I actually would have been OK with an instant coffee. It was just that this particular blend, in the form of my customary ‘long black’, was literally making me shudder each time a took a mouthful. That’s a problem when you’re trying to look friendly, appreciative, and, well, just normal, really. One thing that nearly held me there, in the old space, clutching my coffee with determination and preemptive shuddering, was the free newspapers and the crossword found therein. 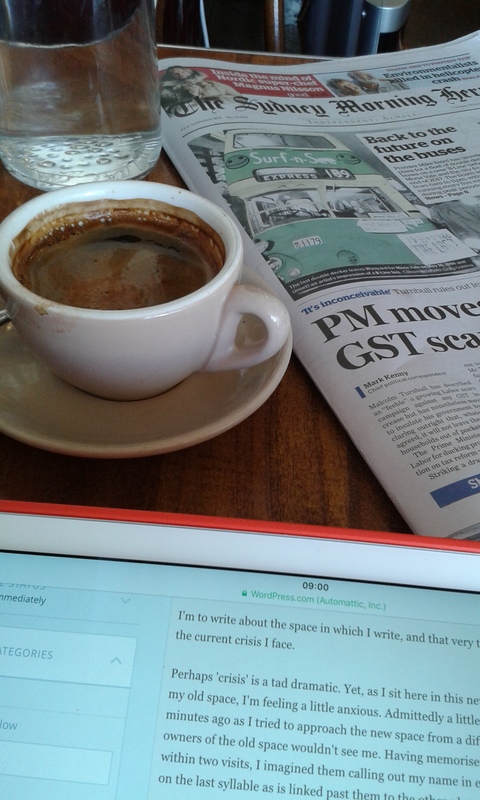 But now I’m here in the new space, with a much better coffee for my tastes, brighter surroundings, free wifi and – you guessed it – a free newspaper. What else can I do, but embrace disloyalty? With time, my disloyalty will become a new loyalty, to a new writing space. Postscript: I turned to the crossword. Someone had got there before me. Could this be my punishment for disloyalty? Two minutes later: the friendly, loyalty-seeking waitress just brought me the other newspaper in the cafe (after another loyal patron had finished with it). The crossword therein is as yet untouched. I believe I’m hooked. 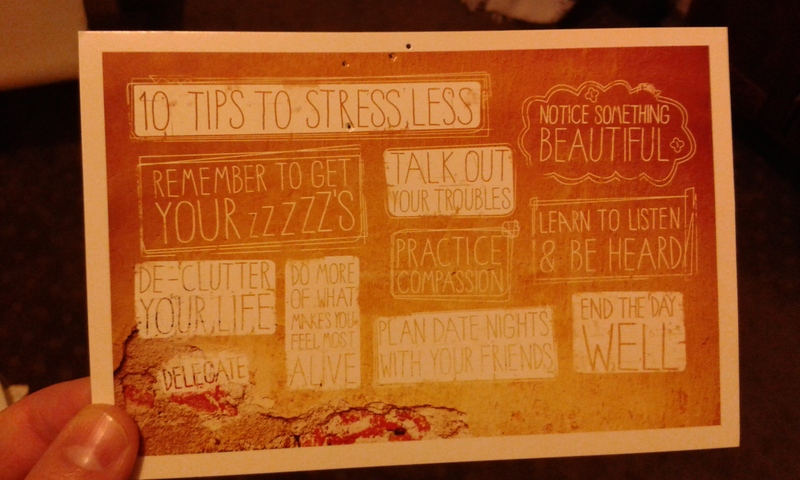 If we’re to write using lists in today’s challenge, I might well start with this trusty old post card that is usually pinned to a noticeboard in my kitchen. Tonight, I had the unexpected delight of minding other people’s children. Not that I expected it would be awful or demanding. I just didn’t expect that it would be a delight. I arrived to find the kids fed, dishes done and a meal kept warm for me. The kids and I played my all time favourite ‘quieten down the kids’ game – ‘Boxes’ – not putting the kids in boxes – rather that little game of dots on a page eventually joined up into boxes. As I left the youngest child’s bedroom, turned out the light, and said goodnight, I heard him quietly say from his bed, ‘God bless!’. God has blessed me, indeed! I write because I’ve set the timer to write. I write because the first writing prompt for this month’s writing challenge is to set the timer and write about why I write. I pause to drink some sparkling water, and I write about that because that’s one of the points of these free-writing exercises: to write whatever comes into your head. I’m not sure I could write whatever comes into my head. Though it’s true that I often write because what I write is often a truer version of what’s in my head than any words I might speak out loud. I write because I can say what I mean to say. It comes out differently. There’s silence in my head which allows the words to form a little more before they are birthed on the page. The clock on the kitchen wall is ticking just now. The dog in the neighbour’s yard just barked. A short, sharp, high-pitched ‘YIP’ that would drive you to distraction. Maybe not you. Maybe you’re more patient. But me? It can do my head in – consume my thoughts – so that what I write – the words that flow from my head to my hands – are filled with the dog next door. The dog has stopped and a siren starts. It’s in the distance, so I needn’t wonder if it’s coming for someone near by – the neighbour perhaps? The siren is getting closer…and the dog has stopped barking…are these things connected? Now the siren and the dog have both stopped their high-pitched noise-making. I’m left with my own thoughts again. Most of the reasons I write are the same reasons that others will be writing about in this challenge. I needn’t repeat them here. I write for me. To give expression to thought. To create something new. I also write because I hope it will be read. I hope it might give expression to other’s thoughts. But that’s a more difficult, nobler task. I write now. I write right this very minute in honour of the 200th follower of my blog! You know who you are! I know who you are! I was there when you followed my blog this evening. Sitting right next to you was the 1st follower of my blog. Hello to you, too! The timer is almost up. I may write alone. But I write because I imagine you’re there with me as I write. But tonight, a big hello to follower #1 and follower #200. Two very special people in my life. Both with a love of words and the communicating of them. Both lovers of ‘the Word who became flesh’. Followers of Jesus who just happen to follow my blog. His words are certainly worth following. At my table this evening, sat my Ambassadorial friend and her teenage son (almost not a teenager anymore, so all the more impressive that he had been happy to come along). Over dinner we got to discussing the writing prompt for today, the final day of a month of writing challenges. I was to write about a treasured possession. I confessed to feeling a little uninspired. I had plenty to write about. I could have written a very lengthy piece about all the things that had been treasured possessions in my life and how pretty much every single one of them have either perished, faded, been destroyed, been lost, lost their significance, or gained a whole, new, painful significance. It was all a bit depressing. So I ditched that idea. Over dessert, we briefly explored whether I could sustain a whole post on how the bar of soap that I use each day could arguably be my most treasured possession? I’d be lost without it. But then I just started worrying (thankfully inside my head, not out loud) that there may be a day in the not too distant future where they stop making bars of soap and force us all to use shower gel! I don’t want to explore that thought until I have to. Then I thought about what is precious to me now. It could be Marcella’s cookbook? My first piece of ‘proper furniture’ that arrived last week? The string of pearls my parents gave me for my 40th? All lovely. All treasured. But then, as I was preparing the meal for tonight, it occurred to me – that at this moment – and many moments before – and no doubt many moments after – my most treasured and most used possessions are my two kitchen knives. I bought them just before I came to this other side of the world, 16 years ago. I had been given a voucher for a department store and I wanted to buy something that I could take with me (in my two suitcases) and that I couldn’t otherwise afford. I had been introduced to sharp, good-quality knives while working in a cafe in Sydney’s Inner West and, having become accustomed to the joy (and paradoxical safety) of cooking with a sharp knife, I couldn’t go back. When I think about it, those knives have been an integral part of my journey of learning how to cook simple food, Persian food, Italian food, food for crowds, food for one. I haven’t yet learnt how to sharpen them on a knife stone. But when others have kindly done it for me – well, it’s better than a bouquet of roses! Give me a bunch of well-sharpened knives any day (though flowers would be lovely too). Tonight, I was required to thinly slice discs of carrot, strips of red pepper, and crescents of onion and celery. My knives were doing what they do best! I’m aware that there is something a bit sharp and evoking of shivers about all this talk of knives. But when no humans or animals (live animals, that is) are harmed in the process, or no magician’s acts are to be endured, knives are part of a creative process of warmth and love. Tonight, they played a part in the creating of a home-style Italian dish – real comfort food – for three people far from our ‘home’ and wearied by some of life’s different challenges. After that dish was consumed, with beautiful potatoes from a nearby county, the bigger of the two knives was cleaned and used to cut through an Almond Cake. I love my knives. They will eventually be sharpened into non-existence, but I think I’ll have a few more years of treasuring them. And as I cut, chop, slice and dice in silence – if you were to listen carefully – listen to my thoughts – you’d occasionally hear me asking for the blessing of the one who treasures me as his very own. He’s no possession. I am possessed by him. Tonight: #32 ‘Chicken Fricassee, Cacciatora Style’ and #33 ‘Almond Cake’ with Ruth and Jesse at my table. Yesterday, on my day off, I sat at my table playing Scrabble with a friend on the other side of the world, then I did some cleaning, then I read a book, all to avoid figuring out of what to write for Day #18, about the perspective of a 12-year-old boy watching an old woman being evicted from her home across the street. I just couldn’t work out what to write. I thought of some things and then I thought ‘But maybe that’s what a 12-year-old girl would think?’ Then I thought ‘What if it’s just what I would think?’ I couldn’t work out if I was being true to the 12-year-old boy. Then I was frustrated that I even cared about being true to the 12-year-old boy. Then I just read some more of a book. I do tend to ‘go on a bit’ about things, inside and outside my head. I’m trying to stop sharing my thoughts out loud so much – but then here I am on a blog page, sharing, typing my thoughts. But then that’s what we were asked to do today. Just sit and type for 40 minutes about whatever is on our mind – even if it’s something a little bit unusual or downright crazy. But I don’t want to share what I’m really thinking! When I do, even with very patient friends, it comes out wrong, or it sounds pathetic (and maybe it is!) or it sounds just like the thoughts I had last time I shared with them. Then I feel the pressure to be interesting and think new things and feel new feelings – well, it can all be a bit much. I don’t want to type what I’m really thinking. Because you’ll have heard it all before. Maybe not from my mouth, maybe not my story, but somebody else’s. They’re common, clichéd, old thoughts. As old as the hills. They’re thoughts full of questions and no answers – or no answers that are good answers. They’re thoughts of conversations never had. Of conflicts never resolved. Of dreams not made into reality. Today I bought a new set of three Moleskine notebooks. My other notebooks are full. I bought the ones that I like, the ones with no lines. In my order-loving life, I like to think I can free things up a bit and give myself some space to write outside the lines – with no lines. I like to think that anyway. Though, today I also bought my Moleskine diary for 2015. I’m a bit hopeless like that. As soon as June comes to an end, I want the diary for the following calendar year. I’m always thinking ahead. I want to plan and have boundaries. So, clearly I don’t love freedom that much. I’ve just stopped my free-flow of writing to check the instructions for today’s prompt. I needed to check I was doing the right thing, after all. Except I discovered that I wasn’t doing the right thing. It was 400 words – not 40 minutes. I’m at 563 words. Wait – 567. Stop that! So, I’m just going to stop now. The sharing of my thoughts, that is. Not the thinking of them. I can’t stop the thinking. Congratulations! You have made your first step to conquering your overwhelming fear of the ‘Unknown’. Before reading the instructions which follow, please take a moment to prepare yourself for more detail than you would ordinarily wish for. You are likely a very imaginative, big-picture kind of girl. If followed, these instructions will help you conquer these tendencies when facing future challenges in the arena of the ‘Unknown’. 1. Stop thinking of it as the ‘Unknown’. Start breaking it down into individual episodes. We have found that fearers of unknown things have been helped by analysing a recent event. Might we suggest that you consider the Women’s Coffee Evening that occurred in your home just two hours ago? Yes? Good. 2. You likely awoke this morning with a vague feeling of dread. Yes? That was your first mistake. Upon waking, as your mind is reaching for images to make sense of the coming day, take hold of the image of your Bircher Muesli that has been soaking overnight in the fridge. It did that without any help from you. Life is like that. Good things happen without you doing much. As it is likely that you bypassed the thought of Bircher Muesli and went straight for the upcoming event of enormously unknown proportions, lets move swiftly on. 4. Take a deep breath and ask God for help. In fact, just admit that he’s the one that will make it work and hand it all over to him. You did? But then you took it back? Yes, we thought so. 5. Don’t try a new recipe from Marcella’s book. We suspect you got that bit right. Your intuitive side would have urged you to go with what you know. 6. At some point in the day, likely just after lunch, you will have considered cancelling the coffee evening. You can’t. You likely worked that out yourself. 7. Make the biscuits instead. 8. Embrace the mystery! Yes, you hate mystery, but it can be your friend. You didn’t know exactly who and how many would come and the ones you did know were coming were bringing women you didn’t know. Challenging? Yes. Exciting? No? Yes! 9. Open the door to the first guests, with a smile on your face. Muscles can be trained. Smiling muscles (we just know you won’t keep scientific detail in your head, so we won’t tell you their proper name) love to be exercised. The smiling will involuntarily continue as you see many women arrive (there were 22 – someone else had to count as you always forget to). Slightly more than comfortably fit in your living room. But not too many to have anyone complaining. 10. Sit back and watch the ‘Unknown’ unfurl in beautifully exciting patterns (Yes, we detailed-instruction-givers can be artistic too!). Was it beautiful? Yes, you say! We thought so. We are confident that these instructions, if followed, will ensure a more pleasant experience the next time this kind of gathering occurs. However, we have known some rare case who cannot be helped. You will know full well if you are one of these cases. If you are, might we suggest a strong coffee and a lot more prayer. Thank you for your attention. Though we possibly lost you back at point 2. At my table today sat an inspiring woman. She’s a woman who has faced a great deal of hardship, for a great many years. Recently she had the courage to say ‘Enough!’ This has caused her even more hardship, but she’s stronger for it. She has lost much, but gained so much more. She told me today that she has only been able to do this with the strength that God has given her. She has felt his empowering, loving presence in so many ways. Today’s writing challenge was an appropriate one to reflect on this evening. My house renovations, inside and out, are coming to an end. The whole project, while necessary, has been something which I have given to God, trusting that he would use it to bring fresh life into a weary heart. He has been doing that. Yet, in some ways I am a little nervous of the project’s completion. I have moments where I fear the silence that might ensue, the sitting and wondering ‘What now?’ But again, I trust that God will give me plenty to ‘find’ in place of that which is ‘lost’. I also know that I follow a Saviour who promises that as I lose myself, I will gain everything. That ‘everything’ may not look like I expected – but it will be an ‘everything’ that lasts evermore. My renovations have been part of ‘Losing Magnolia’. My adventures with Marcella’s cookbook have been part of ‘Losing a Magnolia Life.’ That is, losing a life that is safe – safe in the sense that it involves no degree of risk and every degree of grasping at security. The thing that I have found, sometimes through my choosing, sometimes through God choosing it for me, is that the greatest security comes when I give up my stubborn efforts to keep control. When I let go of control, God steps in and leads me in paths I’d never have experienced before. Some paths by still waters and green pastures. Some through dark valleys with deathly shadows. But life with him in control is nothing like a Magnolia life! Oh, how I’m learning to love that Magnolia-free life! Today, at my table: #31 ‘Tomato and Anchovy Sauce’ with spaghetti and a woman who knows God’s love and leading and absolutely no trace of Magnolia! Today we are supposed to think of a festival or event that we would hate to see stopped or, indeed, taken over by some corporate giant. It’s not simply that I am a little obsessed with Marcella’s cookbook at the moment. I would be genuinely upset if I had to finish this ‘festival’ that is the festival of cooking with Marcella! I would also be upset if it were somehow taken over by some corporate enterprise – not that it would be – but I like the fact that it happens in my head and in my little kitchen, quieting and soothing troubles and concerns as the recipes unfold. It’s a gift to me that I in no way wish to see stop! Tonight, I carried on with the culinary celebration of summer in this land that sees so little of the phenomenon, and rustled up some stuffed tomatoes, grilled prawns, a couple of quick salads and some fresh fruit rather wonderfully drowned in a special beverage! All so simple! In fact the thing that took the longest was the making of the mayonnaise! To top off the evening, when I came to record the recipes and page numbers and the people I dined with in my little book (regular readers may be starting to detect a motif of slightly obsessive behaviour) I noticed that the Mayonnaise (of page 42) that was required to make the Tomatoes Stuffed with Tuna (of page 67) counted as a separate recipe! So I knocked off an extra recipe of the 466 recipes without even realising it! I’m just a little bit excited! Oh, and the food was good. The company was even better. It was wonderful to explore together life and lessons learned in the secure context of God’s overwhelming love for us – and to finish it all off with the taste of strawberries straight from strawberry beds in the sunny south-east! Tonight: ‘Mayonnaise’ (! ), ‘Tomatoes Stuffed with Tuna’, ‘Grilled Prawn Skewers’, ‘Shredded Savoy Cabbage Salad’, ‘Orange and Cucumber Salad’ and ‘Peaches and Strawberries in Sweet White Wine’ with Sean and Ana at my table.